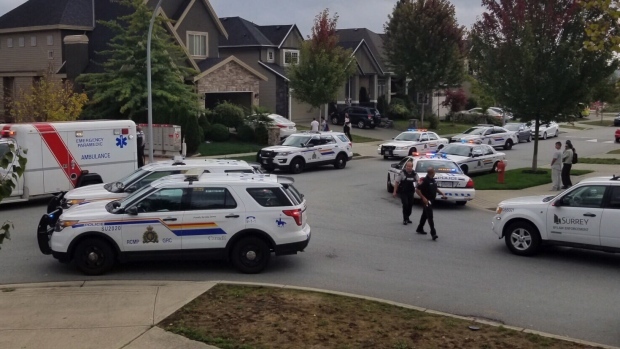 Emergency crews arrive at the scene of a dog attack in Surrey, B.C. on Sept. 11, 2018. An animal control officer is in hospital with serious injuries after she was viciously attacked by a dog in Surrey, B.C. Tuesday. Bylaw officers were responding to a complaint about a Siberian husky that had escaped its fence yard at around 3:30 p.m. The dog ended up on a neighbour's property, but when the officer approached, the animal turned on her. The officer suffered bites to her arm and hand during the mauling. She underwent surgery Tuesday night and remains in hospital. "We originally heard the dog barking and yipping," said Candice Townschon, who witnessed the incident, "and then we heard a woman screaming that she needs help—'Someone call an ambulance.'" According to witnesses, the victim was saying she couldn't get up because of her injures, leaving frantic neighbours with no other way of helping her except by calling 911. "No one could see her or get to her because this dog was still in the backyard," Townschon said. The incident triggered a massive response from emergency services. 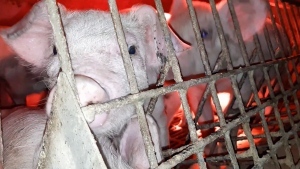 "Ours officers attended along with the police and fire department and they were able to get back there and get her out of there," said Surrey bylaws manager Jas Rehal. "The dog was really vicious. He attacked her. Knocked her down—a lot of bites on her arm." The animal was captured and removed the scene, then voluntarily surrendered by its owners and put down. "Attacks like this are very, very rare," Rehal said. "I can't recall an attack like this on one of our officers." Neighbours said the dog hadn't attacked anyone before. "It was gentle and we haven't heard anything bad about the dog," neighbour Gurdev Pooni told CTV. The City of Surrey does have a dangerous dog bylaw, but this particular animal had never been on its radar before. According to a statement from the city, officials have received 147 complaints about dogs at large so far this year. Eighteen dogs have been put down.